Welcome to another Freshly Brewed Projects from the Latte Girls. This week we are showcasing the upcoming Stampin' Blends. Don't know what these are? Then read on. Stampin' Blends are alcohol based markers for colouring. We all know how popular colouring for adults has become over the last several years. These markers will take your colouring to the next level. They offer an easy way to bring your colouring to life by letting you add hading to your images. You can get really life to your images and lift them off the page. These markers will be available to purchase from November 1. There are currently 12 different colours in the range, with a dark and light shade for each colour. Here are some quick and easy cards I made using the Stampin' Blends to colour the Thank of Thank You. I even did a live video on my facebook page demonstrating how easy these Stampin' Blends are to use. Now that you have seen my creations, head over to see what the other Latte Girls have made. 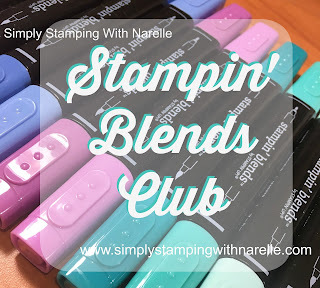 If you are interested in purchasing these Stampin' Blends, then make sure you visit my online store on November 1 to grab them, or email me with your order. If you love them and want them all , but can't afford them all, or perhaps you want some extra coaching on how to use them, then you should join my Blends Club. These stamping blands look super cool. Everything is so neat. You are really talented and creative. I wish you good luck.